A mother and daughter are heartbroken after they say their dog died on a United flight from Houston to New York. NEW YORK -- A New York family is describing the moments they discovered their French bulldog dead after being placed in the overhead bin during a United flight from Houston. Sophia Ceballos, her mother Catalina Robledo and their dog named Kokito boarded the flight Monday at Bush Intercontinental Airport. They said that they were forced to put their puppy in the overhead bin. On the three hour flight to New York's LaGuardia Airport, the dog died. When the plane landed Sophia says she and her mother discovered the heartbreaking news. "She's like, 'he died, he died. Kokito, Kokito. And he didn't wake up. She hit his chest so he could breathe, but he couldn't breathe," Ceballos said. There are differing stories about whether or not the flight attendant knew a dog was in the carrier. A passenger on the flight posted on Facebook that a flight attendant "insisted" the dog be placed in the overhead compartment. "They assured the safety of the family's pet," June Lara wrote. "So wearily, the mother agreed." However, once the flight landed, another passenger gave a different account. The passenger said the flight attendant seemed shocked to discover the dog inside of the bag. She said that she did not know there was a dog in the bag and if so, she never would have instructed it to be put in the bin above. Ceballos and her mother insist that the flight attendant knew, saying that Kokito barked. 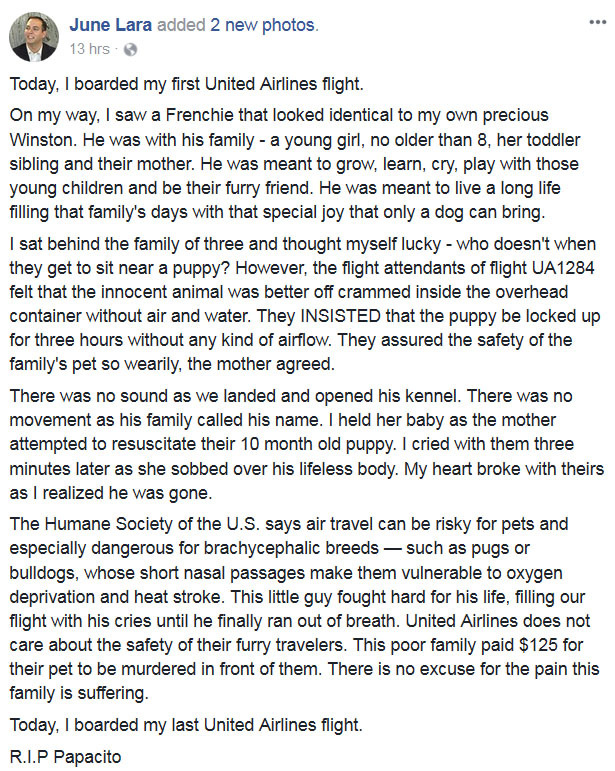 "While we were flying, the dog started barking and barking and there was no flight attendants coming. We couldn't stand up because there was a lot of turbulence so we weren't allowed to," Ceballos described. The family claims they told the flight attendant several times that their puppy was in the bag. "She said, 'Oh, I'm sorry. I didn't know it was a dog. I thought it was a normal bag.' But we told her it was a dog, she's lying," Ceballos said. Ceballos says the flight attendant made them store the bag above because it blocked the aisle. The airline said in a statement to ABC News it assumes full responsibility for the incident. They could not say if anyone has been disciplined as a result of the incident, as the investigation is ongoing. Robledo says United called her asking to settle the situation with money. However, she says this isn't about money. The family described Kokito as a special, smart and sweet dog who loved to play around in parks. According to Department of Transportation statistics on animal incidents on U.S. carriers, United has the highest rate of incidents involving loss, injury or death of animals during air transportation, with 2.24 incidents every 10,000 animals transported.